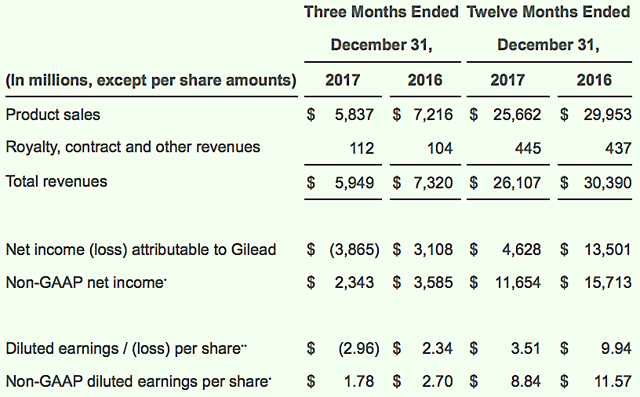 Dr. Tran BioSci Consulting: An Integrated BioSci Alpha Intelligence On Gilead Sciences: What the Fiscal 2017 Earning Foretells? An Integrated BioSci Alpha Intelligence On Gilead Sciences: What the Fiscal 2017 Earning Foretells? Gilead reported favorable Q4 earnings that beat the market’s average estimate. HCV revenue is still in a downtrend. As Sovaldi’s entry into China to take root, sales should be improved. Progress is being made in the NASH segment. CAR-T is progressing robustly as we anticipated. To push for robust growth in the coming years, the company is in discussions to potentially acquire a gene-editing company. 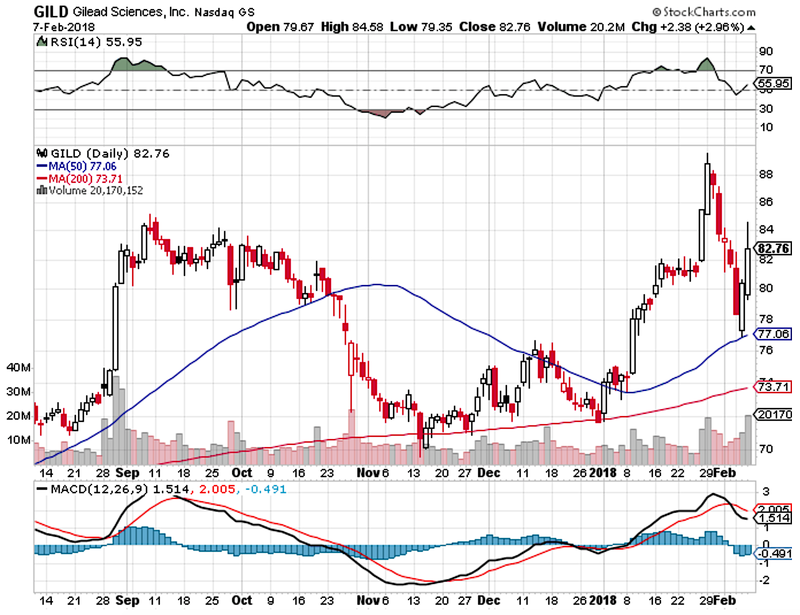 On Feb. 7, 2018, Gilead Sciences (NASDAQ:GILD) - a giant bioscience at the forefront of the innovation and commercialization of therapeutics to service various niche markets - traded $2.38 (+2.9%) higher at $82.76 (due to the positive earnings). Since we recommended the firm to subscribers of Integrated BioSci Investing (on Nov. 10, 2017), the stock has appreciated more than 12%. The capital gain is mostly due to the following powerful catalysts powering the company: Chimeric Antigen Receptor and T-Cell Receptor (“CAR-T”) platform, Hepatitis C franchise expansion into the vast China market, as well as nonalcoholicsteatohepatitis (“NASH”). Figure 1: Gilead stock chart. (Source: StockCharts). At Integrated BioSci Investing (“IBI”), we have much success in finding robust performers. For instance, Nektar Therapeutics (NASDAQ:NKTR) appreciated over 306% for subscribers. Exelixis Inc procured over 55% profits. In this research, we’ll explicate the ramifications of the Q4 earnings for Gilead (and what investors can expect from this stellar growth company). The Foster City, CA, based-firm (Gilead Sciences) is at the forefront of the innovation and commercialization of highly advanced medicines to treat various conditions - HIV/AIDS, cancer, as well as heart, liver and respiratory diseases (as shown in figure 2). As alluded, the company is powered by stellar catalysts (i.e. CAR-T, NASH, and infectious diseases). Despite the temporary downturn in earnings in the recent years, it’s not far from the truth that the firm is gearing up for its next robust growth cycle. Figure 2: Therapeutic pipeline. (Source: Dr. Tran BioSci). Per figure 3, Gilead reported $5.9B revenues for Q4, 2017, compared to $7.3B for the same period (a year prior). The net loss for the quarter came in at $3.9B ($2.96 per share loss) versus $3.1B ($2.34 per share) net income. Interestingly, the $1.78 non-GAAP diluted earning per share (“EPS”) beat the market consensus of $1.70 but is still lower than the $2.70 of last year. Of note, the decline is due to the $5.5B charge related to the tax reform. For fiscal 2017, the company procured $26.1B in sales (and $4.6B or $3.51 per share in net income) - a sizeable decline from the $30.4B revenues ($13.5B or $9.94 per share) from the previous year. Figure 3: 2017 earnings. (Source: Gilead Sciences). The aggregate revenues for the infectious disease segment (HIV/HBV/HCV) came in at $5.2B for Q4 compared to $6.6B for last year. Of this figure, the HIV/HBV franchises procured $3.7B compared to $3.4B for the similar period. The higher revenues for these two franchises are due to the increased uptake of the tenofovir alafenamide-based medicines. Despite favorable sales for HIV/HBV, HCV continues to post declining sales. Notably, this is due to the intense competition in the HCV market from Abbvie (NYSE:ABBV) and others. In light of the said environment, the company is tapping into the vast China market (and recently got Sovaldi to be approved by the China FDA). With the powerful China market as one of the key growth catalysts, we expect that the HCV sales to pick up in 2018 (while both the HIV/HBV continue to improve). While the earnings beat the market estimate, the best is yet to come for Gilead. We noted that Gilead is brewing highly powerful growth catalysts to fuel its next growth cycle: one of those is the NASH franchise. Accordingly, the market for NASH (estimated by Global Data across 7-major markets - the USA, Germany, Italy, Spain, UK, and Japan - to grow at 45% CAGR from $618M in 2016 to $25.3B by 2026. Per table 1, there are several firms racing to secure a NASH molecule. Of note, this is the preview of the Integrated BioSci Alpha Intelligence research, published in advance to subscribers of Integrated BioSci Investing (a community of expert physicians, scientists, executives, market leaders, and everyday investors). In the aforesaid article, we took the deep-dive into the data analysis (and elucidate the potential upsides) that you can expect from this firm. If you're an investor (or thinking about investing in Gilead Sciences), it's a good idea to check out the pending catalysts of this firm. Author’s Notes: We’re honored that you took the time out of your busy day to read our market intelligence. Founded by Dr. Hung Tran, MD, MS, CNPR, (in collaborations with Dr. Tran BioSci analyst, Ngoc Vu, and other PhDs), Integrated BioSci Investing (“IBI”) marketplace research is delivering stellar returns since inceptions. To name a few, Nektar Therapeutics (NASDAQ:NKTR) procured more than 306% profits; Spectrum Pharmaceuticals (NASDAQ:SPPI) delivered over 169% gains; Kite Pharma netted 82%; Atara Biotherapeutics (NASDAQ:ATRA) appreciated +166%. Crispr Therapeutics (NASDAQ:CRSP) garned plus 113%. Exelixis Inc (NASDAQ:EXEL) earned greater than 63% capital appreciation. Our secret sauce is extreme due diligence coupled with expert data analysis. The service features a once-weekly exclusive in-depth Integrated BioSci Alpha-Intelligence article (in the form of research, reports, or interviews), daily individual stocks consulting, and model portfolios. Notably, we’ll increase our price soon. SUBSCRIBE to our marketplace research now to lock in the legacy price and save money in the future.To receive real-time alerts on our articles as well as blogs, be sure to check out our profile page and CLICK the orange FOLLOW button . Asides the exclusivities, this article is the truncated version of the research we published in advance to IBI subscribers. Further, you can read up on Dr. Tran’s background by following this link. If you'd like to get our other once weekly ideas sent to your mailbox, check out Dr. Tran BioSci and sign up with our mailing list.